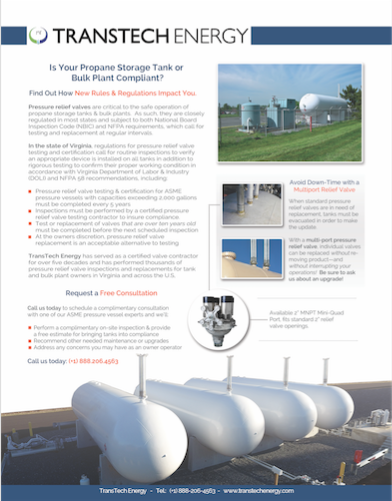 Pressure relief valves are critical to the safe operation of propane storage tanks & bulk plants. As such, they are closely regulated in most states and subject to both National Board Inspection Code (NBIC) and NFPA requirements, which call for testing and replacement at regular intervals. Inspections must be performed by a certified pressure relief valve testing contractor to insure compliance. Address any concerns you may have as an owner operator. Are Your Storage Tank Relief Valves Compliant?